Welcome to May 2nd 2013. May 2nd 2013 seems like a really boring day, doesn’t it? I choose to post this particular entry to prove two things. One, not all visual jouranl enties have to be some grand exodus into our memories or be some thought provoking visual montage. Some of my entries are simply just practicing basic drawing skills that seem so basic as not worth to grace a page in my journal. However, I would disagree. As artists, we need to practice even at the fundamental level. It gets us back to our roots of why we create art to begin with. It allows me to let go of trying to conceive some elaborate scene or recreation of my feelings upon a page and just draw. This particular entry I was following a guided drawing practice session from one of beginners book of drawing that usually sits gathering dust on my shelf. You would think that I would get rid of books like this, but just like this entry shows, I like to take a step back from creating something I would consider awesome and explore drawing by going back to the beginning. 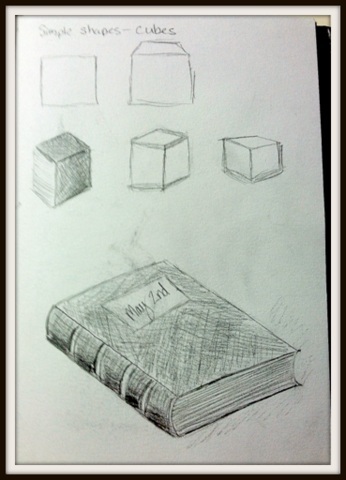 Some of those old drawing books have been with me since I was a child and holds special meaning. They help me to refresh my drawing skills and reminds me why I loved drawing to begin with. The second reason why I chose this particular entry is that it reminds me where I was when I drew it. I was driving back with my husband from our Route 66 inspired trip to Missouri. I was in the passenger seat with my leg propt up on the car dashboard as I was resting my ankle from spraining it just a week earlier in a rollar skating accident. To pass the time during our 9 hour plus drive back home, I decided to risk drawing in my journal along those hilly sections of Missouri. I remember the sun was gently streaming through the windshield and the air was fragrant with the promise of spring. The car was rocking slightly as we wound our way through the country roads. Due to the movement of the car, I didn’t want to try drawing anything elaborate, instead I whipped out that old beginners drawing book I had brought with me for inspiration and started drawing from it. This entry is not an awesome display of artistic talent or does the subject re-create our awesome trip back from Missouri, but it is an idelible reminder of time that I cherish. Thank for taking a moment in taking this little trip back in time with me.